Today: When the herbs start growing like weeds, gather them, and put them in this. It is important to remember that you can build a meal around a sauce. This isn't new, of course, people have been doing it for decades: we eat Eggs Benedict for the Hollandaise (be honest), this wouldn't be genius without the mojo, Brette Warshaw wouldn't exist if it weren't for Marcella sauce. But somewhere along the way, you were probably told that you needed a starch and a vegetable and a protein to call it dinner. I'm here to break that rule. Now go boil some potatoes. We're making Sauce Gribiche for dinner. I first read about Sauce Gribiche when Molly Wizenberg wrote about it on Orangette. And by that point, I already trusted her; she's the one who showed me the magic in flourless chocolate cakes, taught me about leeks vinaigrette, she made me believe in Chana Masala, cooked from the hip. So when she said to try Sauce Gribiche, I believed that I should. It's essentially an aioli, tricked out with herbs and made salty and bright with capers and vinegar. It's heaven on roast chicken and hard boiled eggs, even better on potatoes and asparagus. But it's a little hard to nail down -- everyone has their own version, much like the cobblers of the world -- and that's exactly what I love about it. If you're inclined, you can make it your own. In some versions, like the one by Zuni Cafe, it starts with a 4-minute egg, "which is ingenious," Molly says. 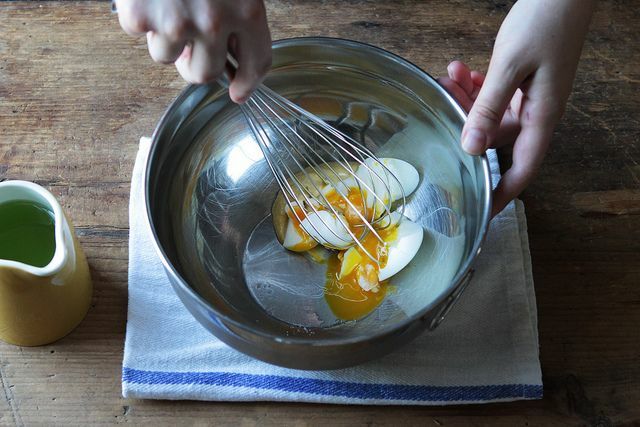 "The yolk binds with oil to make mayo, while the white stays a little chunky and brings subtle texture to the sauce." That's what I start mine with, too, but over the years, I've gone off the cuff a bit. The herbs change with my mood, and I'll add cornichons because I love them but only if I have them. I use grapeseed oil because it's neutral and unobtrusive, but if you want a sauce that's pushier, both in color and in flavor, use olive oil. Below is the formula I have come to know and love, but after yours emulsifies, that's when you can start to play. I like mine saucy and vinegary, less hugging each potato curve, and more getting everywhere and on everything, because that's where I like my Sauce Gribiche to go. 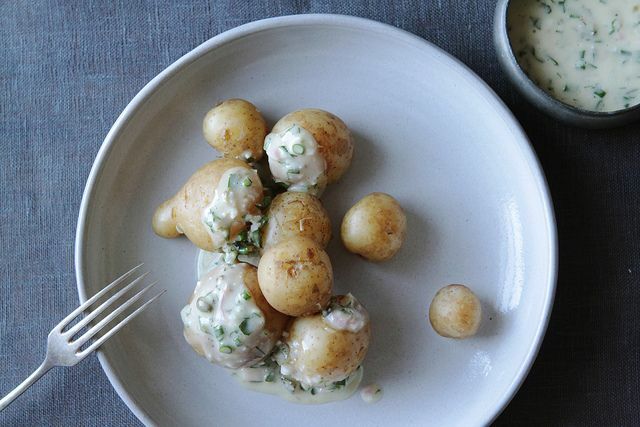 I'd be remiss if I didn't tell you that it makes an extraordinary potato salad. (But only, only, Molly says, "if you mix it up the day before you want to eat it.") I'd also be remiss if I let you stop there: put it in sandwiches, use it in place of tartar sauce -- dip fries into it, two at a time when no one is looking. After all, now it's your sauce-based meal. Make it your own. Sounds very interesting! I love reading how others use this sauce. I can't wait to try it! Can we have a conversation about shallots? They come in such a diversity of sizes. Can you tell me about how many tablespoons you would use for this recipe? Instead of two shallots, which can range from grape size to golf ball size? Thanks! This recipe calls for 2 medium shallots, which usually yields about a 1/4 cup once they're finally chopped. But depending on your taste for them, you should feel free to scale up or down slightly -- this recipe is pretty forgiving, at least as far as the shallots are concerned. Sauce gribiche is one of the best things ever! 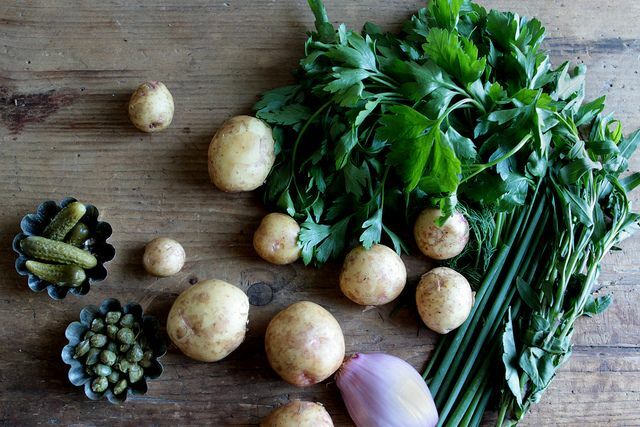 Between gribiche and salsa verde, my summer meals are totally all about the sauce. I love your version of it! I, too, listened when Molly said to make this sauce. So good! I absolutely eat Eggs Benedict for the Hollandaise - and now look forward to eating everything in sight with this. Salads Niçoise Gribiche! Brilliant! Let's find out. I have loved this sauce forever. But it's a standout with mussels served on toast points. Great summer app..
Ohh, I've never had it with mussels. On the list. Adding this to my favorite sauces list. Thank you for making it okay to eat this for dinner -- I will. Sauce Gribiche on poached tarragon chicken is one of my favorite things. Anything poached, really -- but yes this is heavenly. I'm so glad -- let me know how yours turns out! Sauce Gribiche is a standard at my house. The blend of the cornichons and the capers are what really define it for me. This may end up replacing Marcella sauce in my sauce-as-4-meals-a-week rotation. Thanks for this Kenzi! I've been working on my latest batch for three days already. It's glorious.